Start your new year off with a new Cyclo Orbital Polisher Model 5-Pro! This new Cyclo has a variable speed controller to set the speed from 650 to 3000 OPM. This is the first Cyclo with more than one speed! Now you can perform swirl removal and compounding or slow, fine polishing. The new Cyclo Model 5-Pro has all the durable features and heavy duty construction you’ve come to expect from Cyclo. The Cyclo Model 5-Pro has the Vibration Elimination System to allow smooth, fluid motion. 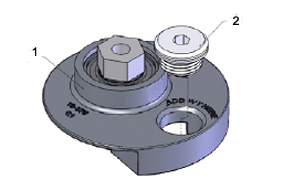 This system is composed of a completely redesigned counterweight and precision matched, weighted inserts. 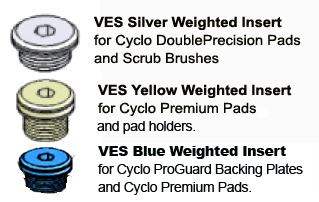 The Cyclo includes all three VES weighted inserts: yellow, silver, and blue. The Cyclo 5-Pro comes with the ProGuard backing plates, which are compatible with the blue weighted inserts. If you want to use the traditional Cyclo pad holders, DoublePrecision Pads, or carpet brushes, you already have the necessary weighted inserts with the purchase of the Cyclo 5-Pro. The Cyclo 5-Pro gives you what no previous Cyclo has – versatility! Try out the Cyclo 5-Pro with variable speed controller for everything from ultra slow buffing to high powered compounding. The Cyclo Model 5-Pro Polisher is one of the polishers that will be featured at Mike Phillips’ Detailing 101 Class on January 29, 2011. Sign up here! Each Cyclo Polisher is expertly machined, manually polished, and hand-fitted to ensure durability and longevity. Its solid metal construction, machined fittings, precisely crafted gears and hand assembly make the Cyclo machine the worldâ€™s finest orbital polisher. In addition, this extraordinary tool is serviceable. Every part on a Cyclo Polisher can be replaced, ensuring that it will continue to perform at its highest level for years, even decades, after purchase. 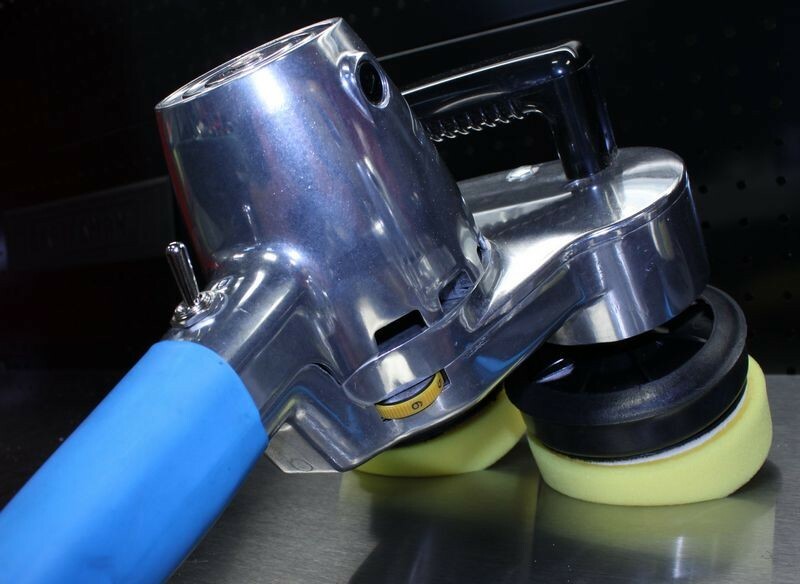 The Cyclo Polisher heads orbit to produce a world-class shine without burning paint or leaving behind any swirl marks. VES technology standard on all Cyclo Polishers. All Cyclo Polishers will include the advanced Vibration Elimination System (VES). VES is available exclusively on Cyclo Dual Head Orbital Polishers and includes a completely redesigned counterweight and precision-matched, weighted inserts. Select the proper VES weighted inserts for the intended attachment system configuration and eliminate nearly all vibration. Cyclo Toolmakers, Inc. Vibration Elimination System (VES™) is available exclusively on Cyclo Dual Head Orbital Polishers and is composed of a completely redesigned counterweight and precision matched, weighted inserts. Prior to this innovation the Cyclo Model 5 polisher imparted only about one-tenth the vibration of traditional rotary and dual action polishers. With the introduction of the new Cyclo VES, the amount of vibration is reduced even further and nearly eliminated. Cyclo VES Counterweight: Completely reengineered, the Cyclo VES counterweight comes installed on all new Cyclo Model 5 Polishers. VES will be available for Model 5C and 6CE polishers starting in 2009. Cyclo VES Weighted Inserts: By simply matching the correct VES weighted insert to the intended attachment system configuration – head assemblies with Rubber Pad Holders or bonnets, carpet and scrub brushes, Quick Connect Adapters with DoublePrecision™ pads, or other Genuine Cyclo attachments – you can nearly eliminate all vibration. WHY LOW VIBRATION IS IMPORTANT: It has been proven that operators face significant risk of muscle, joint and nerve damage caused by the inherent vibration of power tools. By reducing the amount of vibration you can reduce muscle and joint fatigue as well as the potential risk for permanent damage, as described in ISO 5349-1:2001. Mechanical vibration — Measurement and evaluation of human exposure to hand-transmitted vibration.